It is a known fact that Galaxy Tab 10.1 cannot play Hulu out of the box. Yes, some hacks like Brdizzled flash plugin do exist but that they are not that user friendly as it requires uninstalling the old version and then installing the APK of Brdizzled version. Now, there is an app called DroiLu that makes everything much more easier. 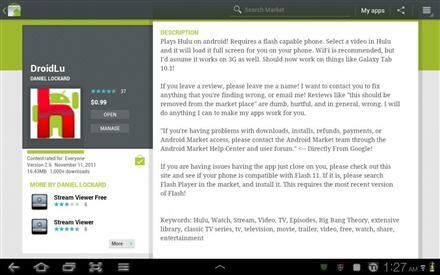 This app lets you watch Hulu on your Galaxy Tab 10.1 without needing any flash plugin hack. DroidLu costs just a dollar and is available via Android marketplace. I am sure many of us would have paid more such an easy solution. Now that most of the hacks do not work with the Android 3.2 firmware, we do not have many ways in order to get Hulu to work. The app does not require you to root your tablet. Just make sure you have the latest version of Flash player installed and you are all set.